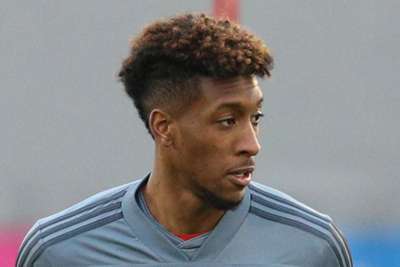 Didier Deschamps has backed Kingsley Coman to bounce back from his latest injury setback after the Bayern Munich winger was ruled out of France's Euro 2020 qualifier with Iceland. Coman had been expected to start France's opening match of Group H against Moldova on Friday but injured his back in the warm-up, and it has forced him to withdraw from the squad. An ankle injury saw Coman miss the first three months of the Bundesliga season and he was sidelined with a hamstring problem last month. Despite the latest frustration, Deschamps does not believe there is too much to worry about for Coman. "It's unfortunate for him," Deschamps told a news conference. "He is obviously sad. "I am not worried. It's not a big injury. He has already had two bigger injuries to his ankle and then his body has compensated. "This time it's a back issue which brings a little tug on his buttock and thigh. He left us sad this afternoon. He was already sad he was not able to play in Moldova as was planned. "He will take care of himself. He is still young but obviously his repeated injuries are not ideal. But he has quality and he is strong mentally, so I hope he would be spared [of injuries] in the future." While Coman has left the squad, Samuel Umtiti is in line to play two games in quick succession despite his own injury problems. A knee issue has limited the defender's game time with Barcelona but Deschamps is confident the 25-year-old will be fit to face Iceland having played the full 90 minutes in Friday's 4-1 win over Moldova. "I think he can do it," Deschamps added when asked about starting Umtiti at the Stade de France. "But I won't hide that I will take time to decide tonight. "It's true he's not had a lot of time to play with his club so I will ask him how he feels to see what we can do. "Even though he played 90 minutes in Moldova, athletically it was not very tiring, especially for a defender in terms of runs, efforts. So on Friday, Samuel was not pushed a lot even if it was a hard game. "Let's see today after the training session how he feels, I would decide afterwards."